Real-time information. On-time delivery. Record-time service. Today’s consumers want it all. But lack of true supply chain visibility continues to cost their loyalty – to say nothing of the USD 300 billion it may be costing organizations worldwide. But imagine if you could earn and keep customer loyalty – not because you asked to be trusted, but because you can prove you’ve delivered on your promises. Quality, reliability, authenticity and product safety can be better assured. Supply chain partners can know for certain where products are in seconds. And an always-up-to-date performance history would be the basis for your reputation and everyone else’s in your retail network. That’s the new retail reality with IBM Blockchain. How can you ensure your coffee is 100% authentic? Shopper confidence grows in aisles and online as blockchain verifies the authenticity and safety of goods. Retail supply chain participants can better ensure they’re trading in ethically-sourced goods to meet emerging consumer demands. From big names to small town businesses, retailers can promote products, earn loyalty and gain insights into consumer preferences in entirely new ways. Food’s journey from farm to table relies on precise cooperation across organizations. To create the IBM Food Trust™, IBM has joined with Dole, Kroger, Nestlé, Tyson Foods, Unilever, Walmart, Carrefour, and others to make food safer, more efficient, and more sustainable. TradeLens is a joint collaboration between Maersk and IBM that includes 90 organizations sharing important shipping data and capturing more than a million events around the world each day. IBM and Mediaocean bring together global leaders including Unilever, Kimberly-Clark and Kellogg’s to address trust, control and arbitrage concerns in the online media supply chain. Their goal? Restore billions lost to middlemen and fraud. 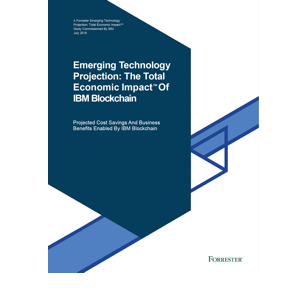 IBM is a leader in blockchain for business, advising clients on how this new technology will bring greater trust and transparency to retail, consumer products and the world’s major industries. And IBM is making significant contributions to The Linux Foundation and their open source Hyperledger technology, on which the IBM Blockchain Platform is built. Learn how blockchain will impact the supply chain for retailers and consumer product manufacturers. Gain insight from business leaders to learn how to convene and govern a network where all participants derive newfound – and lasting – value. Benefit from lessons learned and best practices developed by early adopters at leading blockchain business networks. Let’s create networks and solutions that make the retail and consumer product industries more transparent, efficient and fair to everyone involved.